The Aboriginal Peoples of Taiwan are the First Nations of Taiwan. They number approximately 500,000 or about 2.2% of Taiwan's 23 million people. (A proportion similar to that of Australia or Canada) Taiwan's First Nations were independent before Taiwan was invaded by outsiders. Contrary to the propaganda of the People's Republic of China (PRC) or the Republic of China (ROC) Taiwan is only a recent addition to the Chinese Empire, with colonization beginning in 1624. Taiwan First Nations armed resistance to outside invaders only ended in the 1930s following the Japanese Imperial army's suppression of the Wushe Uprising by the Sediq First Nation which included the use of poison gas attacks. Today Taiwan's Aboriginal Peoples suffer under the same sorts of conditions of internal colonism that has been inflicted on Aboriginal peoples in countries such as Australia, Canada, the USA, New Zealand, and elsewhere. Taiwan's Languages Ethnologue's summary of Taiwan's languages and their status. It outlines the rapid extinction of Taiwan's once great cultural diversity. Report to UN 1993 : This was given to the UN year of Indigenous people in 1993. It is a damming report outlining the suffering of Taiwan's First Nations at the hands of outsiders. This paper provides an overview of Taiwan's Aboriginal politics and history. Wushe Uprising's 70th Anniversary The Wushe Uprising of 1930 marked the last large scale Taiwan First Nation military resistance to Japanese colonialism. This article from the Taipei Times discusses the changes that have occurred since and the problems faced by Taiwan's First Nations today. 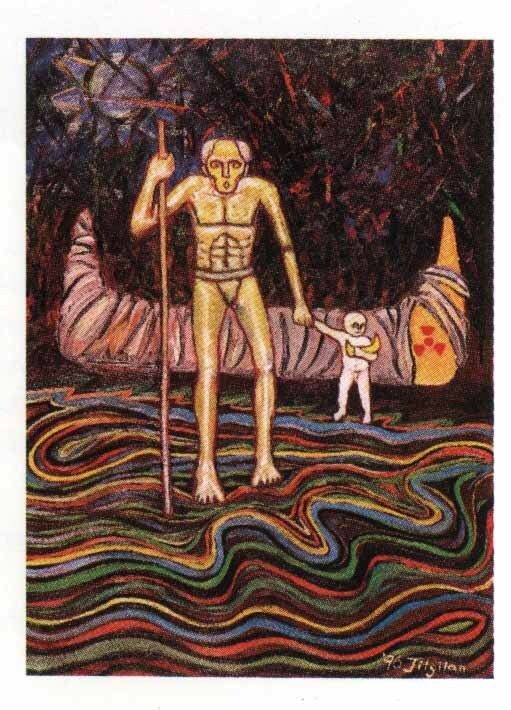 "Where to Go" 1996 by Siijeilogilan of the Tao First Nation. Yami People Protest Nuclear Waste Dump : This article from 1995 outlines the history of waste on Lanyu Island. It is a sad example of environmental racism conveniently ignored when the "Taiwan Miracle" is discussed. TAIWAN POWER COMPANY MISREPRESENTS NUCLEAR WASTE This 1997 report by Greenpeace looks at the misrepresentation of nuclear waste stored on Lanyu Island and poor storage conditions at the Lanyu waste facilities. "There will definitely be bloodshed next time. We'll kill you one by one..." During an attempt on March 12, 2001by members of the Taroko First Nation to recover lands illegally occupied by the Asia Cement Company death threat were made by a company official. The Asia Cement company continues to be in violation of an August 2000 court decision. Report to the UN Working Group on Indigenous Populations : A report by the Taroko People on the destructive effects of cement production on their lands. Asia Cement still fraudulently occupies Taroko Nation lands. It is owned by the Far Eastern Group which is controlled by the Douglas Hsu the 188th richest man in the World with assets of over US$2.6 billion according to Forbes magazine. So if you are in Taiwan BOYCOTT Far Eastern Department Stores and Far Eastern Airlines! Hualien Aborigines Fight to Regain Lands This article is another about the Taroko Nations struggle with Asia Cement. It is from the Presbyterian Church on Taiwan's January 1999 Occasional Bulletin. These are from the International Conference on the Rights of Indigenous Peoples June 18-20, 1999 National Taiwan University, Taipei, TAIWAN. This conference had over 220 participants from various Indigenous peoples from around the world. Resolutions These include supporting the right of Taiwan Aboriginal peoples to participate in UN and in other international organizations. Declarations These concern International Law, Land and Resource Right, and Cultural Rights. This article by Yvonne Lin Mei-jung deals with various legal issues including biopiracy, and music including the Kuo's case against Enigma. Building an Aboriginal society with the media at its centre: The current state of play and outlook for the Aboriginal print media. Lin Ming-teh (Kapi Kalidoay)This article looks at the participation of Taiwan's Aboriginal peoples in Taiwan's modern mass media. Legal Status of Taiwan's Aboriginal PeoplesThis paper by Cheng Feng Shih considers the varied and often convoluted and contradictory legal and legislative measures affecting Taiwan 's Aboriginal peoples. Park Official compares Aborigines to Mouse Crap Here is a blatant example of the sorts of discriminatory attitudes faced by Taiwan's Aboriginal people in their struggles for land rights. This 1999 article by Martin Williams describes the anti-Aboriginal activities within the Taiwan government by a racist organization known as the Pingquanhui or "the Alliance of Taiwan Associations for the Promotion of Rights of Plains People Living in Mountain Districts"
Aborigines Protest Discrimination in Earthquake aftermath Taiwan's September 21, 1999 earthquake was centered in Nantou County an area with a large population of Taiwan Aborigines. They have been some of the worst affected and have received the least attention in government relief efforts. My Blood Your Patent Taiwan Indigenous Television Report December 4 2009. One of Taiwan's most prominent researchers on Aboriginal health, Ko Ying-chin of Kaohsiung Medical University has filed for two US patent applications over the last years based on research involving Atayal Aborigines. The second of these applications published in 2009 involves 1522 Atayal Aborigines. This report shows how Dr. Ko and his colleagues committed various ethics violations including not informing the Atayal Aborigines of the US patent applications. This paper by Mark Munsterhjelm presented at the 2005 Canadian Anthropology and Sociology Association conference deals with how alcoholism related genetics research functions as a new form of governance of Taiwan's Aboriginal Peoples. Austronesian Heroes or Genetically Alcoholic? This paper contrasts journal article representations of Taiwan Aborigines in Austronesian migrations research on prehistoric settlement of the Pacific with genetics research on alcoholism. and then considers how these differing constructions of Taiwan Aboriginal peoples genes are utilized in Taiwanese nationalist discourses versus health discourses. Biopiracy against Taiwan's Aboriginal Peoples Taiwan's Aboriginal Peoples are now becoming a target of biopiracy. Capitalism's latest tools for exploitation of indigenous peoples are the high tech tools of biotechnology. Taiwan's Aboriginal Peoples are a 'prime genetic resource' for these pirates in lab coats. Genes, ethics and Aborigines: This 2000 article describes about the ethical problems of gene research on Taiwan's Aboriginal peoples. Exploitative mythologies used to destroy Aborigines' sense of self ; Isak Afo, an Ami Aboriginal activist, critically discusses the manner in which negative stereotypes of Aborigines and alcohol are projected in the mass media. "Aborigines go better with Coke". Above is an example of the sort of cultural exploitation that masquerades as "economic development" in Taiwan. The government sponsored Formosan Aboriginal Cultural Village was "built to preserve Taiwan's Aboriginal cultures and develop the tourism industry" according to their English guide book. However the above coupon shows how they are mass marketed in Taiwan. Aboriginal cultures are put on display at this amusement park. Note the Mayan style pyramid in the background along with the roller coaster. This Master's thesis by Mark Munsterhjelm deals with how heroes-rescue-Aborigines organizational narratives structured a 2001 exhibition of Taiwan Aboriginal artefacts thereby reproducing the hierarchies of settler/Aboriginal power relations. Involved institutions included the Royal Ontario Museum, Presbyterian Church, Taiwanese and Canadian government agencies sought to utilize these artefacts to glorify the Presbyterian missionary to Taiwan, George Leslie Mackay on the centennial of his death. This exhibition advanced a number of involved institutions' agendas including Taiwan informal diplomacy, Canada nation branding, and corporate public relations. Canada Brand Aborigines: Here are some of the documents I received from an information request filed with the Canadian government's Department of Foreign Affairs and International Trade for information on activities concerning Taiwan Aborigines by Canadian Trade office in Taipei for 1997-2002. Documents cover a number of topics including the Mackay 2001 exhibition of Taiwan Aboriginal artifacts, the 1998 memorandum of understanding on Taiwan-Canada Aboriginal exchanges, and Canadian government public relations planning policies. They give some first-hand idea of the manner in which institutional interaction shapes representations of Aboriginal peoples function within Taiwan-Canada informal diplomatic relations, Canadian nation branding related public relations in Taiwan, and gaining corporate sponsorship through listing of business benefits for sponsors. Drinking, Singing, and Dancing But No Nukes Please- Propaganda, Colonisation, and Taiwan's First Nations This paper by Mark Munsterhjelm looks at the connections between mass media and historical portrayals of Taiwan's First Nations and the colonisation of Taiwan. It contains some 30 photos so it may take a bit of time to load. Traveling along the east coast of Taiwan Linda Arrigo's observations about tourism and Taiwan's Aboriginal peoples. Report on Santsan Village This article discusses ecologically destructive 'development' by mining company on illegally occupied Taroko lands. Article by Linda Arrigo. The Quest for Difference vs the Wish to Assimilate: Taiwan's Aborigines and their Struggle for Cultural Survival in Times of Multiculturalism This is a paper by Michael Rudolph. The Pan-Ethnic Movement of Taiwanese Aborigines and the Role of Elites in the Process of Ethnicity Formation This is a paper by Michael Rudolph. The Emergence of the Concept of `Ethnic Group` in Taiwan and the Role of Taiwan`s Austronesians in the Construction of Taiwanese This paper by Michael Rudolph considers the ways in which Taiwan's Aborigines have been utilised by various concerns in Taiwan. 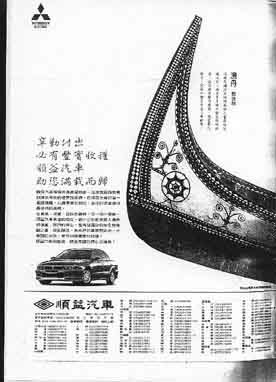 Above is an example of how the Shung Ye Museum of Formosan Aborigines ("The Mitsubishi Museum") uses Taiwan Aboriginal Cultures for advertising Mitsubishi motor vehicles. This came from the backcover of a 1998 Taiwanese magazine and was also featured on the Taipei Mass Rapid Transit trains during 1998/9. This is the English version of an article that appeared in the Chinese language Lih Bau newspaper in Taiwan in December 1999. It discusses Mitsubishi's historical role in the 1874 military expeditions against the Paiwan First Nation and its current use of Taiwan Aboriginal cultures for commercial purposes by Mitsubishi affiliates, the Shung Ye Trading Company and the China Motor Company. The Shung Ye Museum of Formosan Aborigines Here is their Chinese webpage featuring merchandise and Collection photos. The Government's Sinorama magazine on how good the Shung Ye Museum is, really. Maya Coffee Research Paper This paper looks at the tragic history and use of propaganda at various stages in the production of coffee and its distorting role as this relates to the Maya Peoples of Guatemala. It makes a case study of Taiwan's Uni-President Corporation's "Maya Coffee" line of canned coffee beverages which feature the "environmental musician" Matthew Lien of the Yukon. It looks at the way renderings of Aboriginal peoples are constructed in Taiwan's media. Taipei Times This English language frequently carries news regarding Taiwan's Aboriginal peoples. Enter "Aborigines", "Aboriginal" , or "Aborigine" in their search engine to reference a large number of items. Contains articles from fall of 1999 to date. Lih Pao NewspaperThis is a well done non-profit Chinese language daily newspaper published in Taiwan. Taiwan Aboriginal News Magazineis a weekly news program produced by Taiwan Public Television Service in Chinese. Has a 37 Kbps and a high speed 300 Kbps versions of it's weekly TV news magazine using Windows Media Player. Use Microsoft Explorer to access news broadcast which is changed weekly (Netscape doesn't seem to work). Also has an large archive of Chinese language news articles dating back to 1999. . The Fourth World This is a mostly Chinese language webpage with many articles and links to various resources on Aboriginal peoples in Taiwan and elsewhere as well. Atayal: A Non-Profit Organization. Provides background information on Taiwan First Nations. Cultural Survival Quarterly Special Segment, Volume 26:2, Summer 2002 articles. This article provides a brief historical background and overview of Aboriginal issues in present day Taiwan. The Underside of a Miracle: Industrialization, Land, and Taiwan's Indigenous Peoples This article the University of Ottawa's Scott Simon deals with use of Aboriginal lands under colonisation and describes the ongoing Asia Cement/Taroko Aboriginal Land Dispute. A Minority within a Minority: Cultural Survival on Taiwan's Orchid Island By Linda Gail Arrigo, with Si Jilgilan (Huan Ching-Wen) and Si Maraos (Chung Chi-Fu.) This article deals with the issues of cultural loss and Taiwan government nuclear waste poisoning the homeland of the Tao Aboriginal people of Lanyu Island off Taiwan's southeast coast. In the Name of Progress By Linda Gail Arrigo. This article deals with the adverse effects on Aboriginal territories by marble mining in Eastern Taiwan. NativeWeb is an excellent resource for Aboriginal issues from all over the World. Settlers in Support of Indigenous Sovereignty : This is an very useful website with information from many different Aboriginal groups about their struggles. Mala Bay is a new "Aboriginal themed" Amusement Park. Built by Taiwanese and foreign corporate interests is part of the Taiwan government's national development plans. Academia Sinica's "Tribes of Taiwan An article from Taiwan's top research institute with stereotyped ahistorical renderings (English). "PhDs Playing Aborigine"- Academic and Business leaders frolick on Taroko Aboriginal lands. The 1999 University of California Berkeley (UCB) sponsored Fourth Asian Leadership Conference, was held on unceded Taroko First Nation lands at the Taroko Grand Formosa Hotel in Taroko National Park. It is a vivid example of how Taiwan Aborigines are constructed as entertaining caracatures by dominant institutions. This link is to a series of pictures of the various Taiwanese and Western attendees being entertained by Taiwan First Nations and playing dressup in Aboriginal traditional ceremonial clothing. These photos was posted as a "memory" at a UCB University Relations webpage so I reposted it under Fair Use guidelines so you can judge for yourself. It is important to note UCB is a major centre for Asian Studies and has received funding from the Shung Ye Museum of Formosan Aborigines. Aboriginal Planet Here is the Taiwan section of the "Aboriginal Planet" (their name not mine) webpage for the Canadian Department of Foreign Affairs and International Trade. Learn first hand about the diplomatic utility of Aboriginal peoples in back door relations between Canada and Taiwan. The title pretty much explains it. This was signed in 1998 and is the defacto diplomatic agreement governing Taiwan-Canada exchanges. A bit boring but worth the read to get an idea what these exchanges are really about which is backdoor international relations for Taiwan. if you are associated with any Taiwan Aboriginal organisations and would like to use this site for posting articles or videos (I have plenty of bandwidth left) please send me an e-mail. Note: This page was started in 1998 and is maintained by Mark Munsterhjelm who is responsible for the contents.